A Nigerian cargo plane belonging to Allied Cargo this evening crashed near the El-Wak sports stadium in Accra, killing ten people. The plane crashed after it missed the runway of the airport in Accra, and crashed into some vehicles parked at the village. The sad incident happened around 7.15 pm this evening. Oh my God. Not again. Chai....sad news this nite? #isorai. RIP to the ten people that lost their lives. They really need to train these stupid pilots properly and fix these their retched-arse planes...wtf....!! 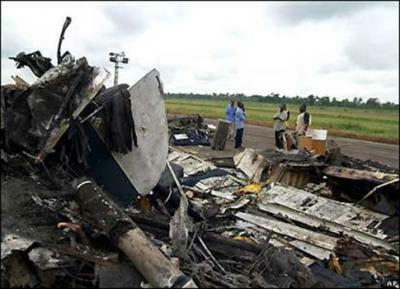 any time i hear about plane crash, home or abroad i always remember the sosoliso plane crash...gosh!! plane crashes always bring bk those very bad memories. This is Sad.I had a Premonition about Nigerian Plane Crash On Friday as i was outside ma crib at nite looking to d sky,i actually..Neva mind.May de RIP.Flowers for d Dead!!! They'll start with the 'blaming' session now but the dead are dead already. Eeyah! God help us in this particular country sha. All is Vanity.I hope God Almighty accepts their Souls, rest in Peace . Pls Linda is d plane coming 2 9ija or goin 2 where? Man made had a lot of problem but God made is original & eternal. I wish you had prayed against it. I really wish you had. Can't believe how gullible some of our people can be. "Nigeria carry disaster go another country"....this person who made this quoted comment must be a Moron and a Nitwit. ameen may god make its a good returned. this has nothing to do with the pilot. im sure he did everything he could to prevent the crash. the airplane had mechanical problems and the brakes failed. So please do NOT blame the pilot who is also my Uncle. R.I.P. to all the 10 people who lost their lives.